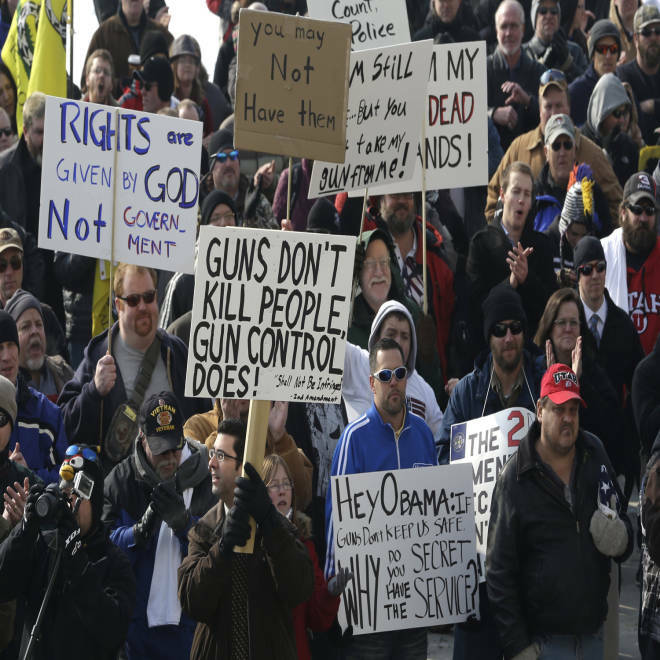 Gun-rights advocates gather outside the Utah Capitol during the National Gun Appreciation Day Rally Saturday, Jan. 19, 2013, in Salt Lake City. That’s a stark change from almost a year ago. A troubled young man had just killed 20 students and six adult staff at Sandy Hook Elementary School, opening fire with a semi-automatic arsenal. 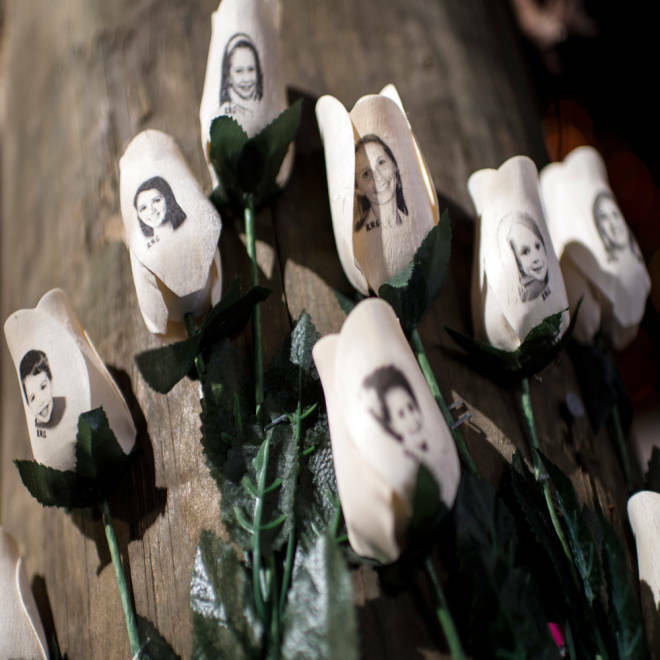 The 2007 Virginia Tech shooting was bloodier, but Newtown and its young victims struck a special nerve. President Obama pledged to put “everything I’ve got” behind reforms, proposing the broadest gun control legislation in decades, and the groundswell of public support doubled the size of the two largest gun control lobbies in America, The Brady Campaign to Prevent Gun Violence and Mayors Against Illegal Guns. It also gave rise to a third lobby: Americans for Responsible Solutions. Giffords pitched the group as a counterbalance to the National Rifle Association, one with “millions” of supporters and cash to match the clout of the opposition. “Legislators will no longer have reason to fear the gun lobby,” she promised in an editorial announcing the organization. “Fight, fight, fight” she added in a poignant stump speech over the summer, her words slurred by the path of an assassin’s bullet she survived in 2011. 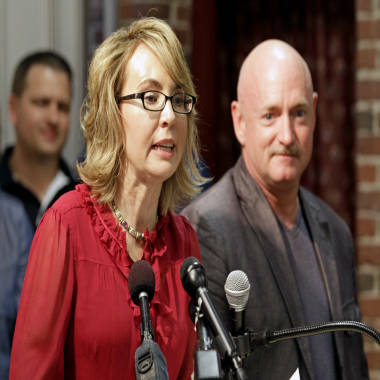 Former Arizona Rep. Gabrielle Giffords, accompanied by her husband, retired astronaut Capt. Mark Kelly, speaks during a news conference at the Millyard Museum, Friday, July 5, 2013, in Manchester, N.H.
At a glance the effort to avert another mass shooting has never been stronger. Giffords’ so-called Super PAC raised $6.6 million in the first half of 2013, more than any other, and its organizing arm recruited half a million new members. All told, the lobbying effort of the gun control side is on pace to spend more than it did after the Columbine shootings in 1999, according to data provided by the Center for Responsive Politics. But the pro-gun side has grown even more, the CRP data shows. It has added popular no-compromise groups, such as Gun Owners of America, and maintained a nine-to-one spending advantage on Hill. The NRA alone has outspent the Big Three in 2013, stoking members with an ad campaign built around the need to “stand and fight” Washington regulators. It says a million new people signed up in the first 9 months of the year, bringing the NRA rolls to 5 million strong, more than double what the Big Three muster combined. The Big Three are trying to make it one. That’s why, in late June and early July, Team Giffords—which includes Gabby, her husband Mark Kelly, her service dog Nelson, and a phalanx of operatives—toured seven states in seven days. Toting a suitcase of their own firearms, they preached “gun responsibilities,” and tried to engage hardline locals and gun rights politicians. At the same time, Mayors Against Illegal Guns ran a 100-day, 25-state summer bus tour, calling for an end to gun violence. But the results of both tours were mixed at best. In state after state, major politicians ducked Giffords and Kelly, despite (or perhaps because of) ample advance notice of their arrival. In Alaska, Mark Begich, one of four Democrats who voted against closing the gun show loophole, was said to be vacationing on an island without cell service when the tour arrived. In North Dakota, “friends in the NRA” forced a last minute venue change, according to a Team Giffords advance man, who himself declined to be named for fear of mixing with gun-grabbers from Washington. And when members of MAIG arrived in Fargo, the mayor told them that guns were not a problem. The grassroots side of the campaign struggled as well. At a MAIG event in Columbus, Ohio, the Buckeye Firearms Association organized a counter rally that drew twice the crowd. In Raleigh, N.C., when Giffords passed through, a gun blogger turned out two-dozen people shaking green signs that read: Guns Save Lives. But perhaps the most dramatic scenes were in Manchester and Dover, N.H., where protesters arrived “full battle rattle,” as one man noted on a Facebook page for the counter-protest, toting guns—including an AR-15—and forcing Giffords out a back exit after her speech. The same week, Mayors Against Illegal Guns made its own campaign stop in the state, where police subdued one pro-gun activist with a taser and dispersed the crowd. And they decided to escalate their rhetoric, jettisoning “lost” for “killed” or “murdered,” and adding graphic new details to well-oiled speeches on the Capitol lawn. But again it didn’t work. By the grand finale, a reading of the long list of people killed by gun violence this year, the audience had thinned to nothing. Even the advocates had drifted away to a reception, according to the Washington Post. So why doesn’t anyone seem to care? The easy answer from the left involves the NRA, its fervent supporters, gun manufacturers, and words like “greedy” and “heartless.” But the truth is, as always, more complicated. Even before Washington shutdown, the Big Three had almost no hard events on the calendar for October, and sparse calls to action compared to earlier in the year. Each organization will mark the Newtown anniversary in December, but how, exactly, they aren’t ready to say. And a similar sense of hiatus pervades activists on the front lines. None of those contacted were willing to rank gun control as their top concern, or even something they were still working on, not with marriage equality, immigration reform, health care, and poverty crowding the mind. Until then, however, she doesn’t see the point.